Ten winning projects were shortlisted with the top three teams selected as grand winners based on their ability to build IoT solutions around the “Smart Cities” theme, real-world application, innovation and individual capabilities of the teams: Seven other winners from the top ten received RM300 as consolation prizes. For 28-year old startup founder Leong Yok Tien, the win was a pleasant surprise to him and the team, “It’s an honour for us to be recognised at this hackathon, given the brilliance showcased by the participants here. With our project, we hope this would soon address the common yet critical water leakage problems in our country, and we look forward to seeing the related parties adopting our solution in real-life application.” Participants also made use of Long Range (LoRa) technology – a signal modulation technique that provides long-range communication link for low-power wide-area network which can reach up to 2-3 km in urban areas and over 15 km in sub-urban areas. The technology was provided by The Things Network (TTN) Netherland – a global, open, crowd-sourced Internet of Things data network with over 200 communities worldwide. Johan Stokking, co-founder and technology lead of the TTN said at the judging ceremony that he was largely impressed with the determination and innovation presented despite the time constraint for the participants. He enthused, “Part of becoming a smarter city involves setting up the right opportunity and infrastructure that invites community participation. JomHack certainly hit its mark with these brilliant pitches from its very talented community from all over the country. 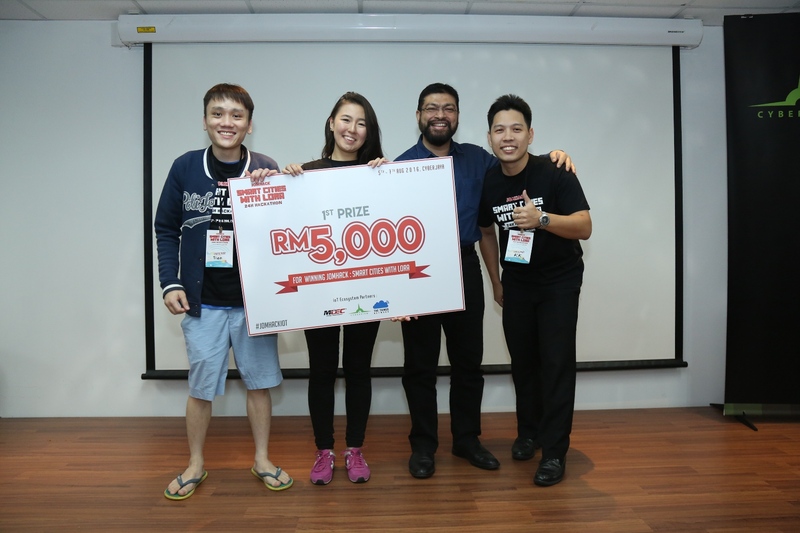 I’m happy to surmise that everyone here is without a doubt, the best group of hackathon participants I have ever seen.” Sharing his thoughts on JomHack, Mahadhir Aziz, Head of Technology Hub Development Division, Cyberview Sdn Bhd said, “Innovation is at the heart of daily life here in Cyberjaya. As Malaysia’s Capital of Creation, we are beyond excited to have played host to such a prestigious event. Through this collaboration with MDEC and The Things Network Netherland, we are proud to be part of a movement that could improve the living experience of the community in the long term. We hope that these ideas will be developed to become enablers and key elements of our smart city vision that is driven by a culture of innovation and supported by unparalleled connectivity, sustainability, security and liveability.”ervices Sdn Bhd, and Gain Secure Sdn Bhd.